The theme of the service was Strength and weakness. There were a number of elements that formed the image, the first was an element from Messy Church that was looking a the story of Joseph and we sang ‘Any Dream will do’ which has some interesting lyrics and the sense of being in the dark at the end of the song waiting for deliverance. The sermon from David began with the psalm and his focus was on God being an ever present help in times of trouble. So the elements of the readings, stories and the sermon formed the basis of the image. 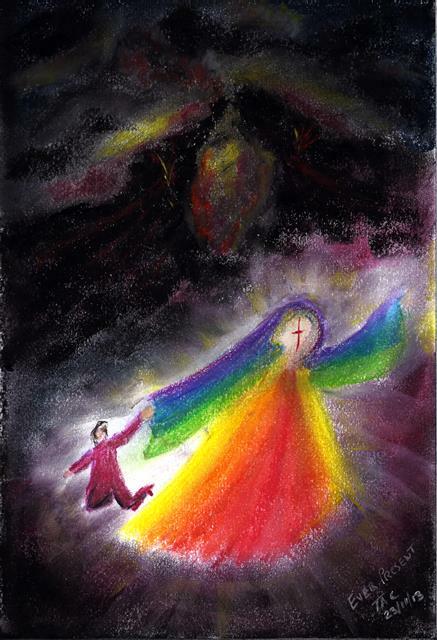 For me there were resonances with the promise of God in the colours of Josephs multicoloured coat and the hope in Jesus Christ.